Tiny Tips for Library Fun: What Makes a Great Youth Librarian? What Makes a Great Youth Librarian? 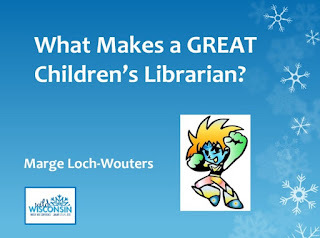 After talking to children's librarian peers, directors, library educators and library users, I've got some ideas to share on what makes a great children's librarian. Join me Wednesday, January 23 1-2:00 pm CST for a webinar session at the online Wild Wisconsin Winter Web Conference sponsored by Wisco's library systems. Registration is still open for this and all 15 webinars presented by national and state speakers.